Scooter by the Sea: Wildlife? 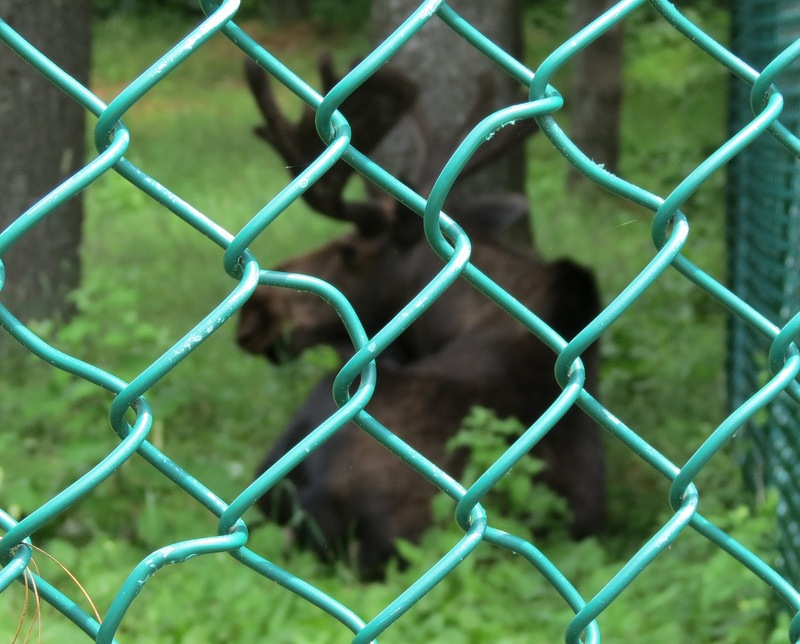 It's called the Maine Wildlife Park, but if everyone is behind bars and fences, is it really "wild?" 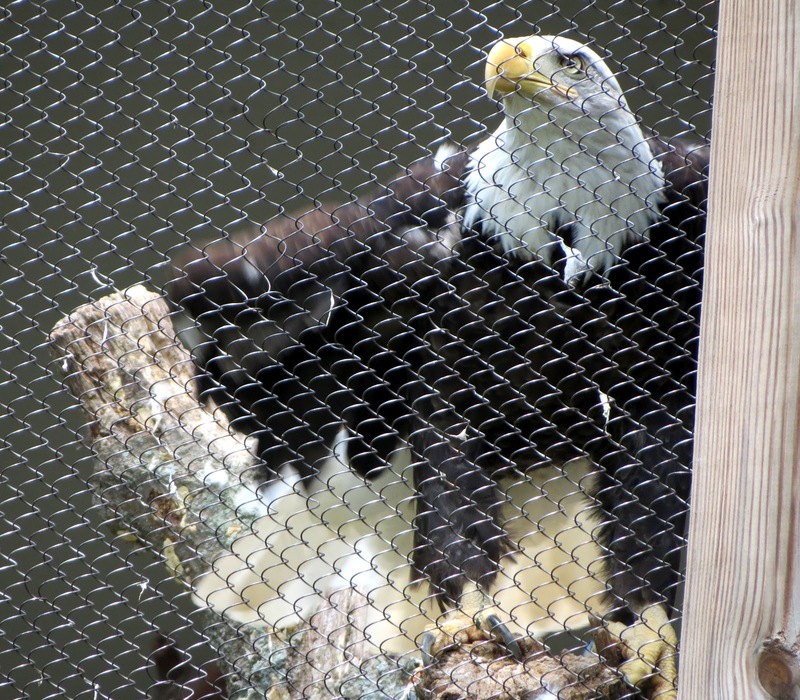 Well, that's as political as I get, but I can't help but feeling sad about seeing birds and animals kept from roaming the forests of Maine as they please. 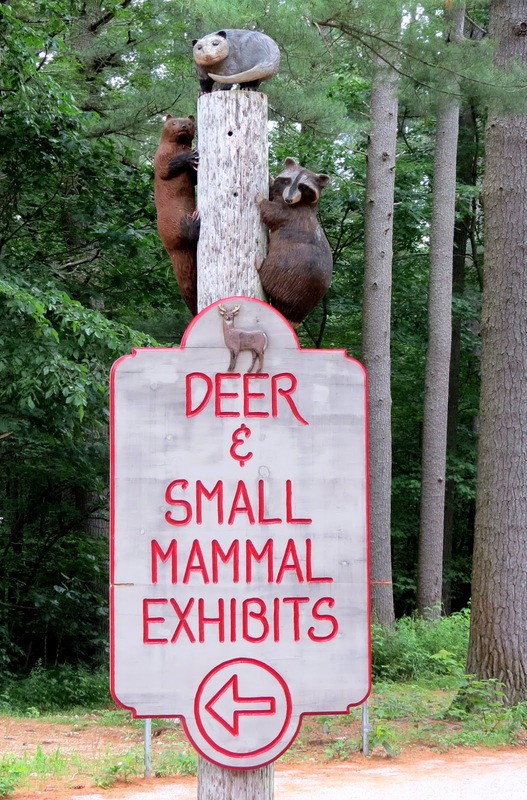 At the entrance of the Park, where Mike and I got a generous discount for having lived longer than the trees, the various areas of interest are pointed out with exceedingly cute signs. 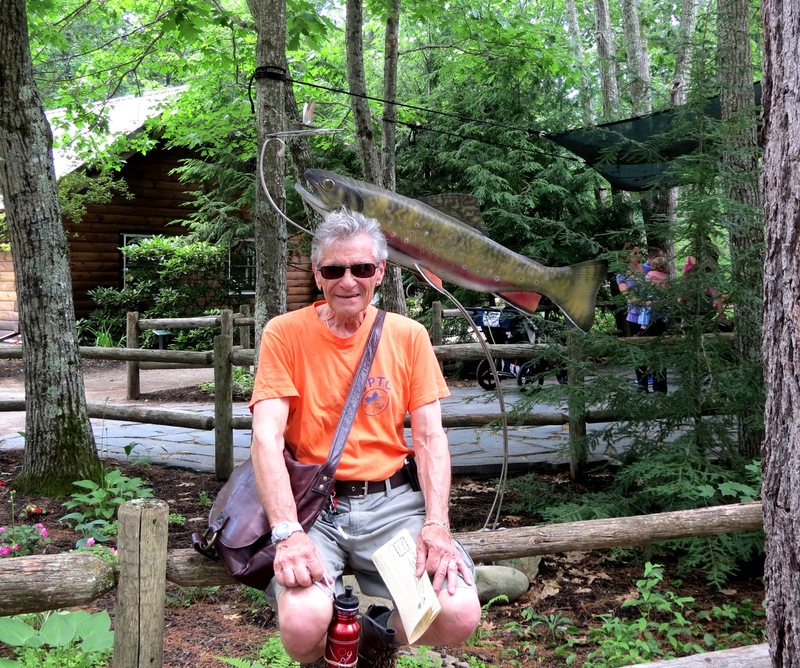 Mike poses like a real Mainer. He patiently walked slowly as we trudged dozens of yards through the park. One of the benefits of using a cane - no one expects you to hurry along. 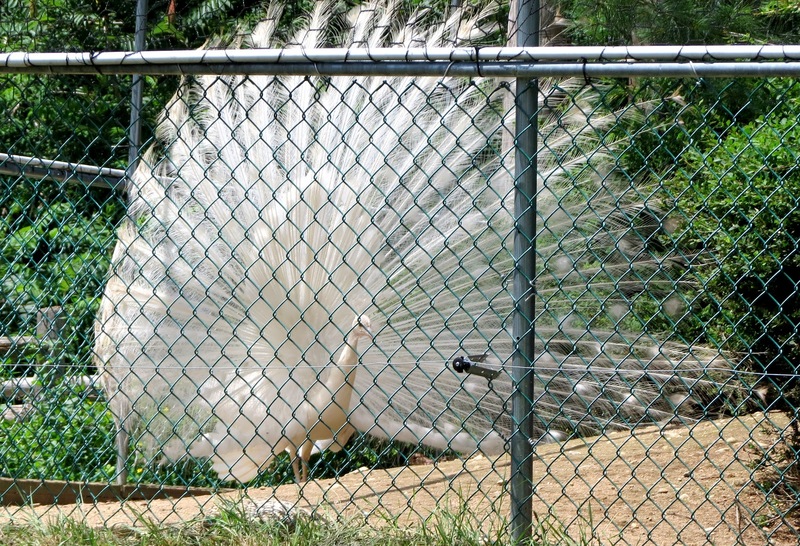 Let's start with my favorite stop on the tour - the peacock cage. 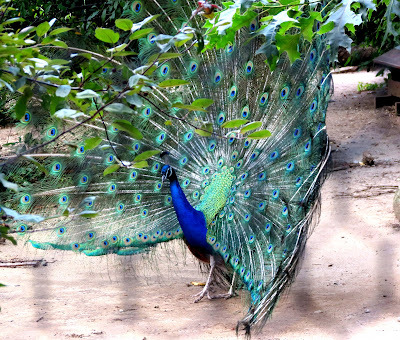 With dozens of visitors waiting, the egotistical bird strutted around until the crowd grew to a size he deemed worthy of his efforts. "Not yet - gather 'round, people - this will be worth the wait." "Was I right? Ain't I just the best looking thing in the whole wide world?" "And that's not even my good side - check this out!" If this fancy pheasant started to put down its cage-mates, I'd have to believe he was running for political office. 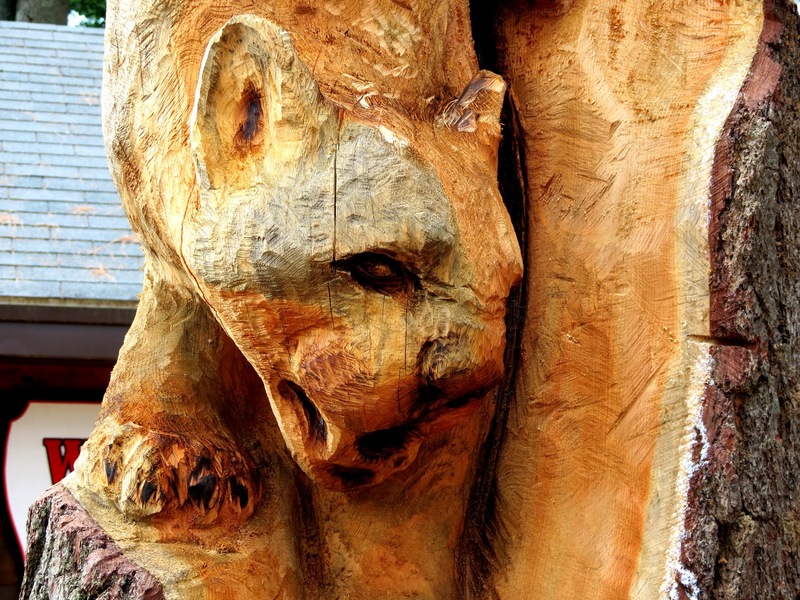 This mountain lion and the bear below were carved out of dead trees, and rather amazingly so, I must say. From beauties to the beast. 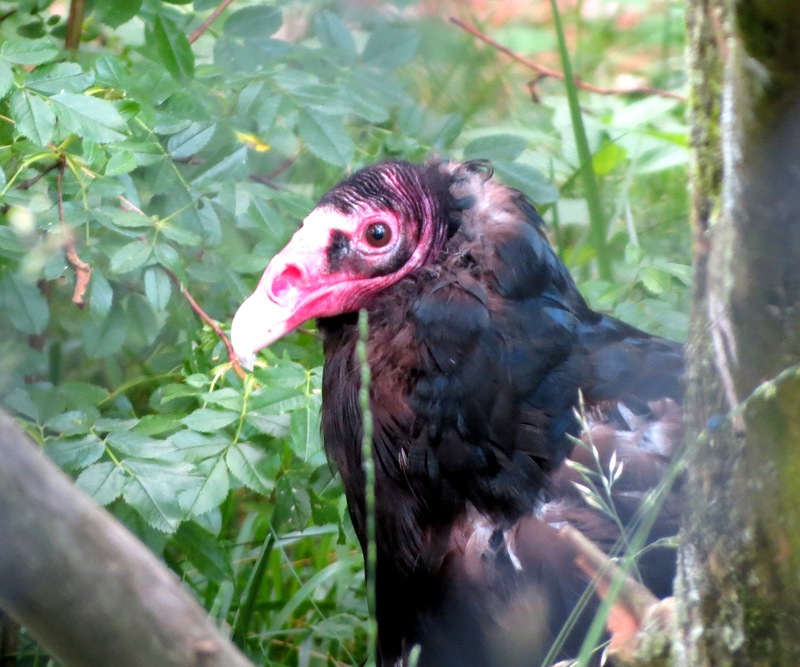 The turkey vulture just doesn't promote cuddling. Awww - what a cute big kitty cat. It's a lynx, and it's four times the size of my cute little kitty cat, Teddy Ballgame, posing proudly below. This is sad. 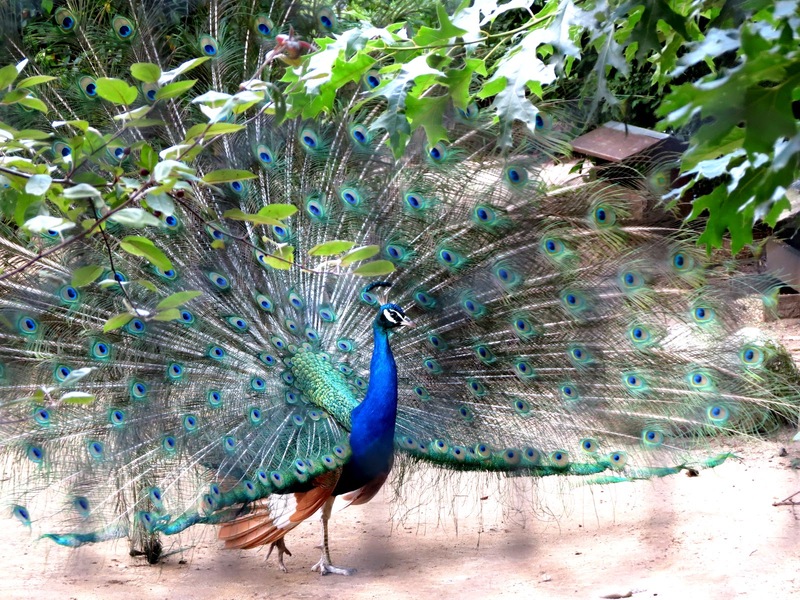 What a majestic bird, but it simply doesn't seem right - unless he's injured - to keep him in a cage. Why, not even people can enjoy life in a cage, can they? There was a second fence keeping visitors from the green inner fence, suggesting perhaps that the Maine Moose isn't as sweet as gentle old Bullwinkle! Our final stop was the bear cage. 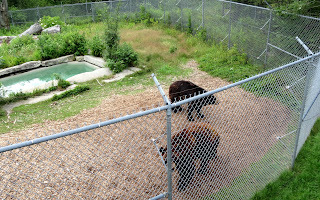 As we looked on, a family of four stopped to see the bears. 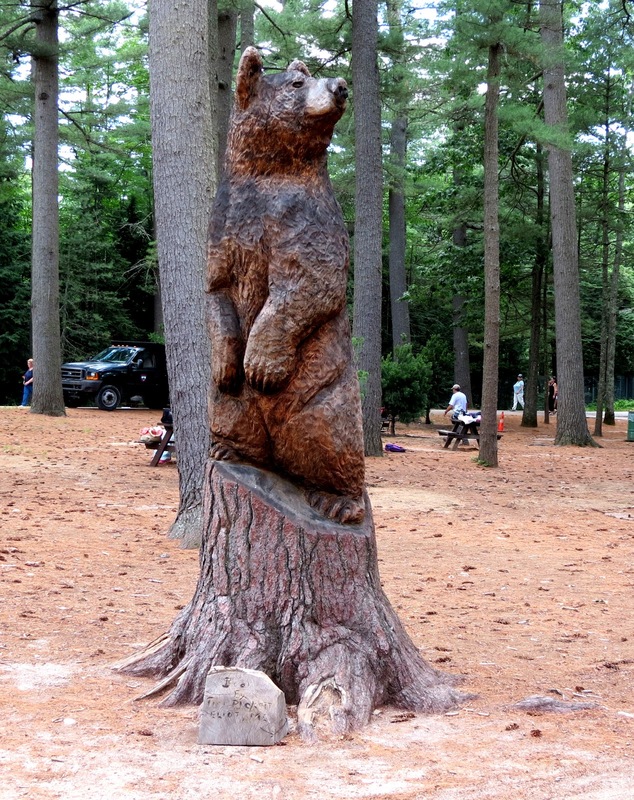 The mother read the sign for her kids: "It says that these are Maine Black Bears." The little girl, maybe four, pointed out the obvious, proclaiming in a loud voice: "But that one is BROWN!" The weary father led his brood away, no doubt to avoid having the bears question their identity. Sounds like a fun day. Zoo's and wildlife parks are bitter sweet. It is nice to see the animals but I too always feel so bad for them. I know we wouldn't want to live like that. 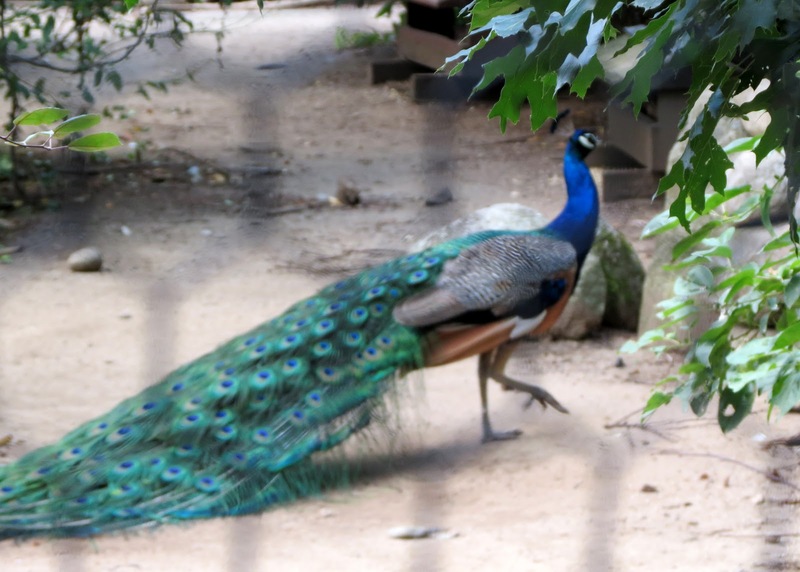 I understand when they are hurt and need rehabilitation and there are those that cannot ever be released into the wild, but I don't like that some are trapped specifically for zoos. I think Teddy Ballgame looks nice and snuggly. It was indeed a good day. As we walked by a lily pad-filled pond, I said to Mike, "Listen to those frogs!" Mike asked, "What frogs? We don't have frogs in New York City." Not that the slimy little things make sweet music, but it was interesting to realize that some sounds are foreign to some people. And you are correct - Teddy is a snuggly little kitty. He's also hyperactive at night, and loves to explore places where he knows humans sleep. Nice outing. I agree with Trobairitz. It's very difficult to view these creatures inside cages. It's the spirit of the animal that we find the most thrilling, but in a cage, well, that spirit is gone. 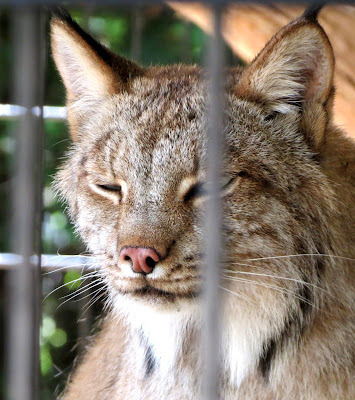 It's very true that many are in zoos for care and conservation. 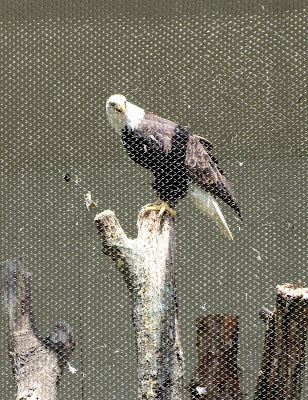 I'm sure that eagle could not survive in the wild due to injuries suffered at some point. I used to work with a wildlife rehabber and there were so many injured animals that just had no place to survive. 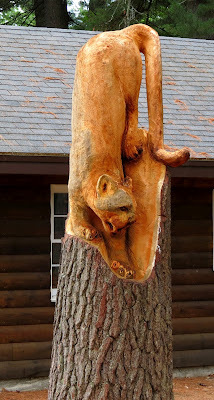 And of course, many creatures are taken out of the wild because of loss of habitat. I think the human experiment has been going on long enough to come to a conclusion: _______________ (You fill in the blank). My conclusion: No zoos. Before we plan to level some area for profit, take a vote among the animals. And until a vote can be facilitated, leave things as they are. Finally, let injured animals rehab in their natural habitat, tended by vets and caretakers. We didn't get to finish discussing this, but I agree with Trobairitz and Martha. If the animal is injured and could not survive in the wild, then yes. Otherwise I have a hard time. In the San Diego Zion eons ago I looked into the eyes of a jaguar...it was not a pretty sight to see him behind bars. The eyes always tell the story. I like the stump sculptures. I'm seeing them in front of peoples homes here in Missouri. I've seen bears, an eagle, turtle and even a farmer with a basket. I think it is a marvelous idea. Isn't it cool that talented artists have found this new media? I wonder if there are sculptors who look for stumps to carve - if not, there should be!